On Friday May 10th, we bid an early morning farewell to Newport's Ivy Lodge, and drove north to Rumford, an eastern suburb of Providence. Our destination was Metacomet Country Club, a 1925 Ross design. Metacomet, like the other Ross courses we visited in Rhode Island has a storied past. The likes of Gene Sarazen, Bobby Jones, and Glenna Collett Vare strode these fairways in the "Roaring 20's." Metacomet (named after an Indian chief who befriended the Pilgrims) reminded Lisa and me of Granville Golf Course in Ohio which is one of our favorite Ross courses. Like Granville, Metacomet features lots of undulation with significant elevation changes on the shots into the greens making club selection difficult. The highlight of our game was playing with a delightful couple from Chapel Hill, North Carolina, Karlton and Staci Creech. Karlton is the Assistant Athletic Director at the University of North Carolina while Staci teaches. Karlton is a solid 7 handicap but it is Staci who is the star player in the family. One look at her textbook swing (honed by fomer tour player Jim Ferree) confirmed she had indeed played college golf with the Tarheels. I cannot recall a missed shot by Staci during her round. 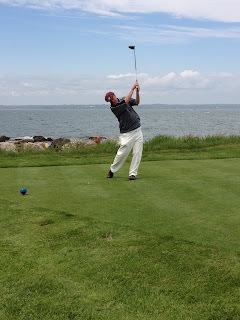 On Saturday, we played venerable Rhode Island Country Club designed by Ross in 1911. We were greeted by a thundershower, and we donned our rain suits. We were beneficiaries of another great pairing: former Ohio Women's Amateur champion Alison Reifers (and mother of Kyle- a current tour player) and Steve Kress. Yawning fairway bunker at R.I.C.C. The rain did not adversely impact our enjoyment of this immaculately groomed course. RICC features a mix of parkland, woodland, and seaside holes. The final four are hard by Naragansett Bay. I snapped the picture below of Alison who with her classic swing played an excellent shot on the par 3 17th. The Society's annual meeting followed at the club after dinner. The Society has a relationship with the Tufts Archives which houses many of the original Ross course design drawings at its facilities in Pinehurst, N.C. Audrey Moriarty, the Archives' executive director brought the Society up-to-date on the ongoing effort to digitize the archives. 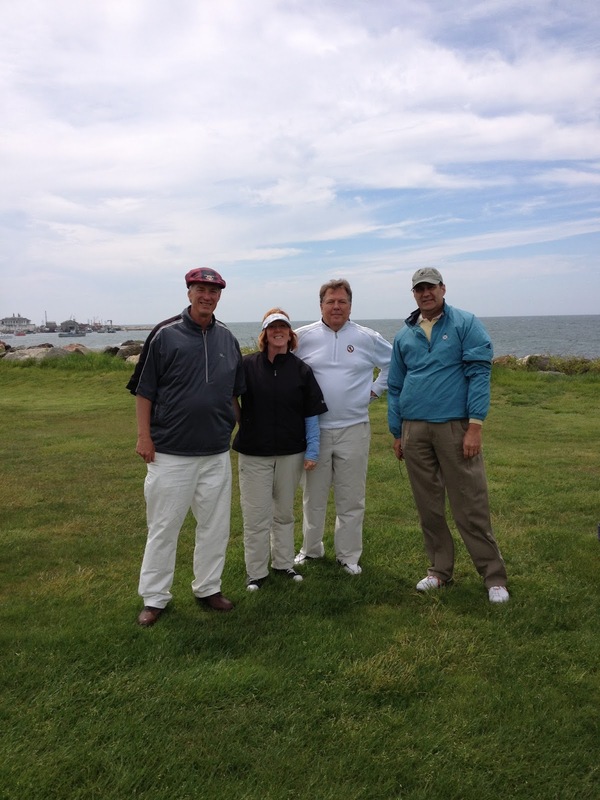 Our Sunday game was played at Little Compton's Sakonnet Country Club. This area of Rhode Island is chock full of visual appeal. Charming seaside cottages, many held by families for generations, are in evidence here. One of those cottages was Donald Ross's summer retreat. A current generation of the Ross family still owns the cottage, and they were gracious enough to host a brunch for the Society prior to our round at Sakonnet. We loved all of the Ross courses we played in Rhode Island, but Sakonnet C.C. was particularly special. Another great combination of seaside holes coupled with bucolic marshland characterized this Ross design. The clubhouse was Lisa's favorite on this trip. Our convivial foursome was completed with Tennessean and Society president Mike Miller, who played to a very low handicap, and Shawn Pierson from Sarasota. As was the case with Point Judith, we encountered several stone walls flanking the fairways on the holes close to the water. 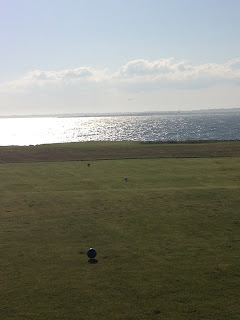 We faced strong breezes in our face when playing toward the water as was certainly the case on Lisa's windblown tee shot below on the par 3 2nd. The drivable par4 17th was a noteworthy hole with its rocky outcroppings threatening any off-line shot into the green. 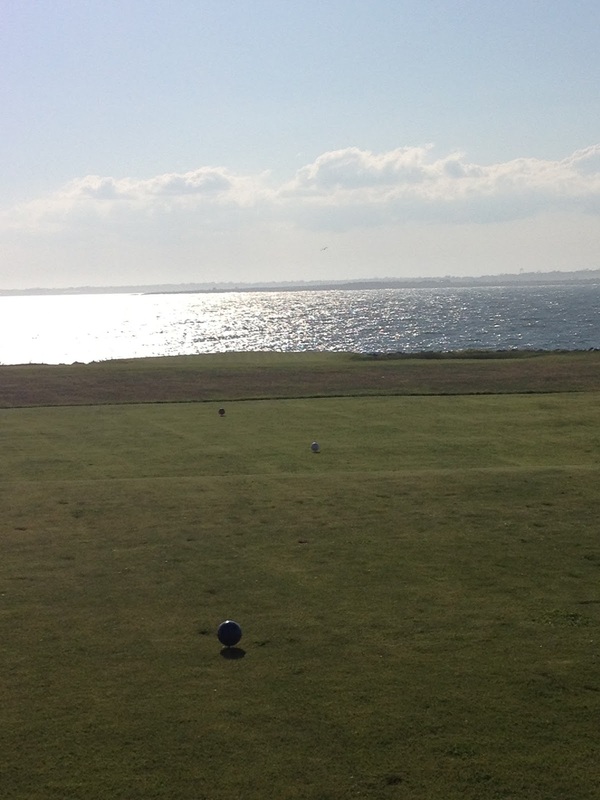 The mix of Sakonnet's s entertaining and scenic holes proved testament to the fact that a course's lack of length is no barrier to a wonderful and challenging golf experience. A distinct advantage of joining the Donald Ross Society (www.donaldross.org ) is that its members are afforded the opportunity to play courses that would otherwise be extremely difficult to access. Also, you meet kindred spirits who share your love of the game. Our final game was held at the 1914 Ross design, Wannamoisett C.C. in East Providence. This club held the 1931 PGA Championship, and still hosts the Northeastern Amateur, previously won by the aforementioned Kyle Reifers. Wannamoisett presents a scorecard anomaly. Despite the fact that I played it at only 6400 yards, there were 8 par 4s measuring over 400 yards on a par 69 layout. We played with Marla Flinn, a fellow Ohioan who is a fine player. BILL AND LISA VISIT NEWPORT, R.I.